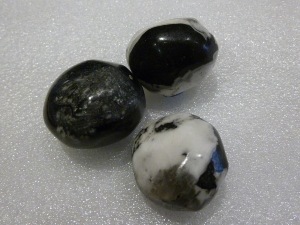 Chrysanthemum stone is a black and white rock made up of gypsum clay, dolomite and limestone, with internal crystals of Calcite, Feldspar, Celestite or Andalusite, in patterns which can resemble chrysanthemum flowers. These stones, originally discovered in Japan, are also found in Canada, China and the USA. Chrysanthemum Stone is believed to allow one to connect with the joy of creation, expression and manifestation. It may help one become more open and daring in one’s approach to life. It may also assist in overcoming fear of limitation and encourage an experience of abundance, contentment and joy.